PHOENIX, Ariz., June 21, 2017 – The “Everyday Heroes” Kenworth T680 was auctioned off this week at Ritchie Bros. in Phoenix. The winning bid was submitted by Mike Jimenez, owner of Phoenix-based J&L Transportation, which resulted in $89,000 netted in support of Truckers Against Trafficking – a 501(c)3 non-profit devoted to stopping human trafficking by educating, mobilizing, and empowering the nation’s truck drivers and rest stop employees. According to Kendis Paris, TAT’s executive director, the $89,000 donation is the largest one-time gift in the organization’s history. “We are absolutely thrilled and overwhelmed by the generosity of the industry, and extremely grateful to Mike Jimenez and J&L Transportation for adding the Everyday Heroes Truck to its fleet,” she said. Jimenez, who was traveling at the time, produced the winning bid by proxy. “Though I have not encountered human trafficking, it does exist in our world,” he said. “It’s been my experience that when our industry gets behind a cause, it is a worthwhile cause. When Don expressed his interest, along with Inland Kenworth and all the other supporters and sponsors intent on doing this project, I knew J&L should be a part of the answer to end such heartbreaking events. I’m confident that TAT will use the proceeds to continue the education efforts and training necessary to end human trafficking in the future. Without their efforts, I would still be blind to this epidemic in our society,” Jimenez said. The Kenworth T680, fully loaded with a 76-inch sleeper, 485-hp PACCAR MX-13 engine, and Eaton(R) Fuller Advantage(TM) 10-speed automated transmission, joins 35 other trucks in the J&L Transportation fleet. The truck will be placed in J&L’s dedicated fleet and utilized in Arizona, California and Nevada. According to Paris, human trafficking is an industry estimated to be worth $32 billion in the United States alone, and $150 billion globally. 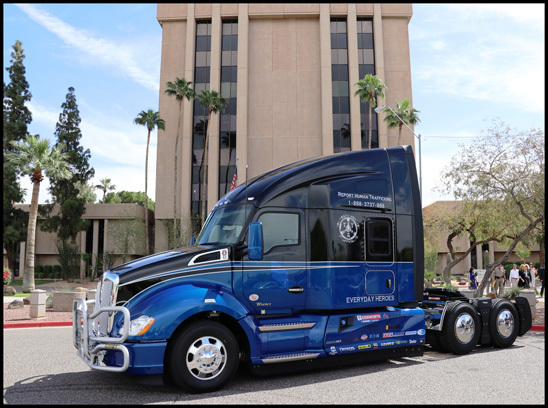 To further its education, TAT has the Freedom Driver’s Project – a mobile exhibit, which educates members of the trucking industry. The project was at Inland Kenworth in Phoenix on June 19, and at Utility Trailers next door, on June 20. Nearly 200 people were trained.